In the world, there are very few mountains comparable by their beauty with this snow-clad giant. Words are flat and helpless when you talk about the Khan-Tengry’s beauty. You must see it with your own eyes. The sunset at the Peak is stunning: surrounding mountains are drowning in the dusk while the Peak, dominating over all other mountains around, turns flaming red in the rays of the sitting sun and clouds cast twirling shadows streaming down its slopes. “Khan-Tengry” - “The Master of the Sky” in the Mongolian language, from time immemorial is known to native local inhabitants, Kyrgyz, as “Kan-Too” - “Blood Mountain” (“kan” means “blood”, “too” - “mountain”). 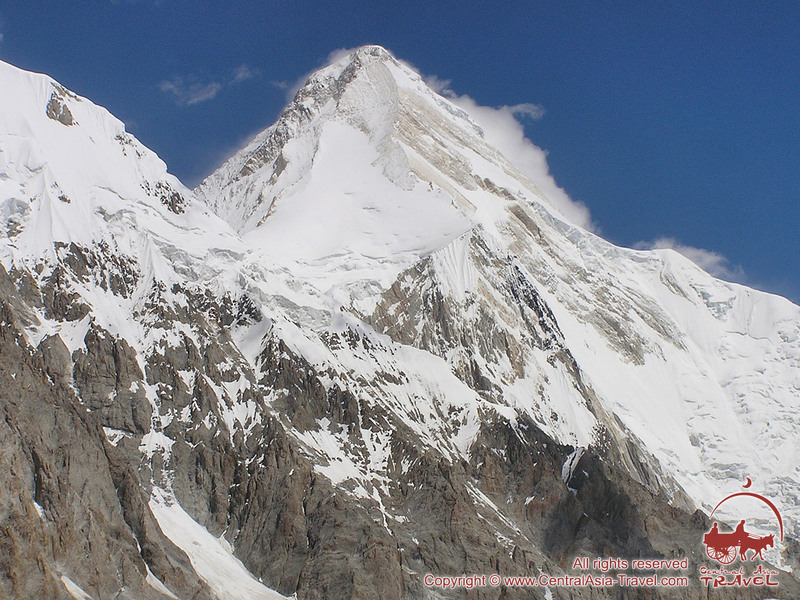 First scientific account on the Peak dates back to the middle of the 19th century when Khan-Tengry had been seen and described by notorious Russian explorer of the Tian Shan mountains P.P. Semenov-Tian-Sanskiy, in 1856-57. Here is an excerpt from his personal diary: ”When we got up to the top of the mountain pass it was about one o’clock p.m. We were surprised and dazzled with the sight we’ve got. Straight to the south of us laid the most magnificent of all mountain ranges I’ve ever seen. The entire range top to bottom consisted of snowy giants which, to the left and right hand side of me, I could number of not less than thirty in total. The whole range with intervals between mountain tops was covered by interminable shroud of eternal snow. Amidst these giants, an outstanding one was strikingly contrasting with the rest by its snow-white pointed pyramid, which, from our pass’ heights, other peaks seemed to be half the height of...” And that was the Khan-Tengry Peak. 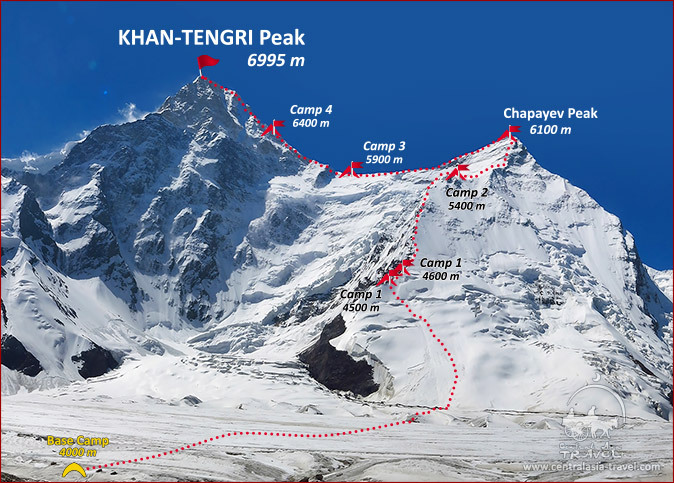 As of today, more than 10 mountaineering routes have been laid to the top of the Khan-Tengry Peak. All the routes can be subdivided into two main groups: northern routes commencing from the North Inilchek Glacier and southern routes - starting from the South Inilchek Glacier. Most popular with mountaineers is so called “Marble Rib” route, the route №1 beginning from the Semenovskiy Glacier on the south. This route is under constant monitoring by rescue services. 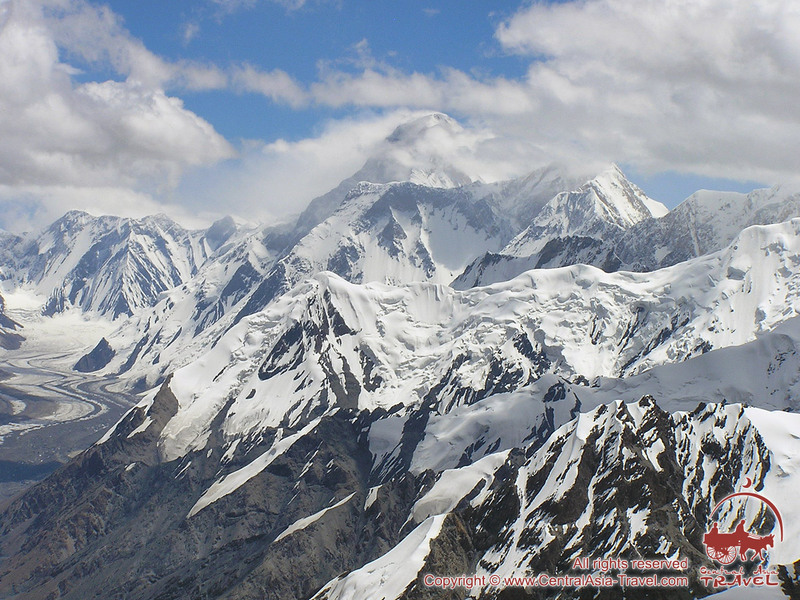 Besides well-known peaks like Peak Khan-Tengry and Peak Pobeda, the area has over 30 peaks around 6,000m-high. Some of them still wait for their first-ever climber. 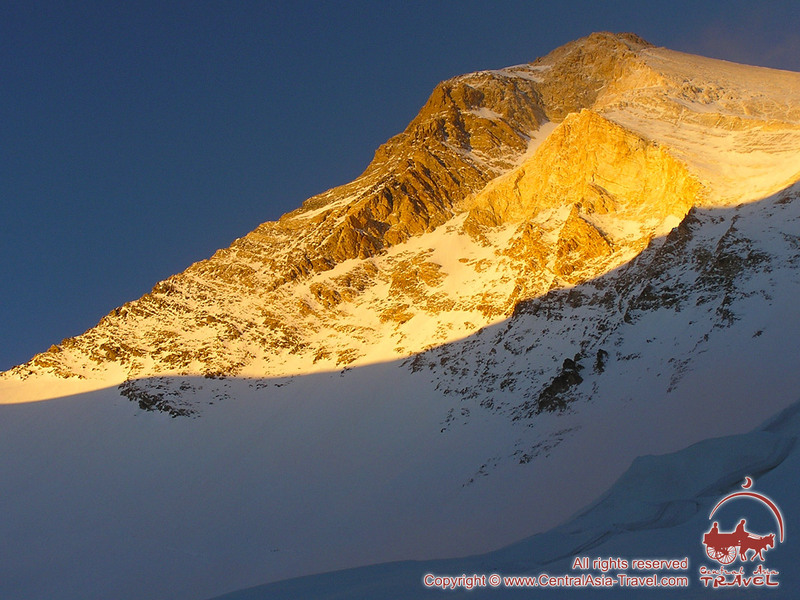 Our tour program supposes option of arriving to the Base camp of Khan-Tengry Peak via Bishkek. After that you will make a car transfer to the summer camp Karkara, whence a helicopter will take you towards the North and South Inilchek Glaciers to our Base Camps. 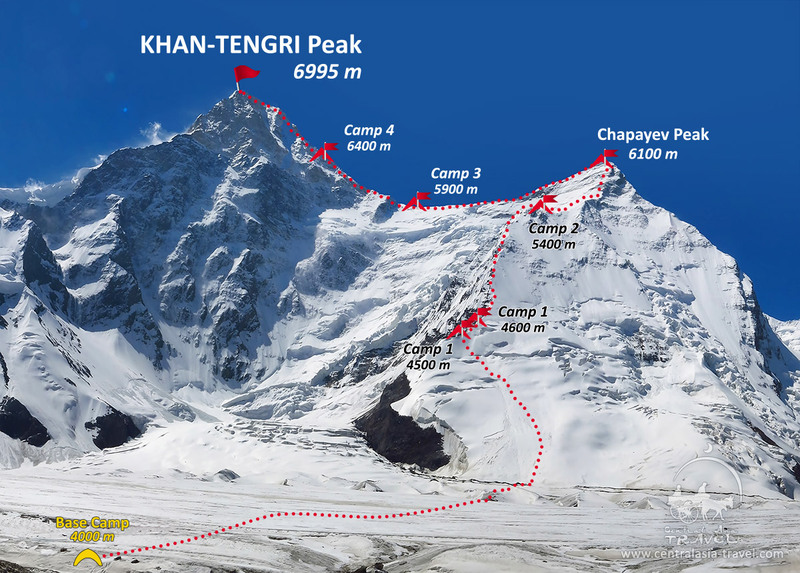 Khan-Tengry is in the short list of the world’s top-class summits that every self-respecting mountaineer dreams of climbing. But give up your hopes to succeed to the top if your personal track record includes only a few simple routes and your high-altitude physical and technical preparedness is not appropriate. The mountain is extremely serious both physically and technically. Classical West Rib route that is described here below is not a simple one. Before setting off, the one adventuring on the climb must consciously weigh up one’s potential and ability of doing that. Because when the dice is cast you are to meet with the Great Mountain face to face. Day 1 Arrival in Bishkek. Meeting at the airport. Transfer to a hotel. Accommodation. Free time for wandering in town, visiting Osh bazaar, etc. Day 2 Drive to Karkara (460km). Accommodation in Base Camp “Karkara”. 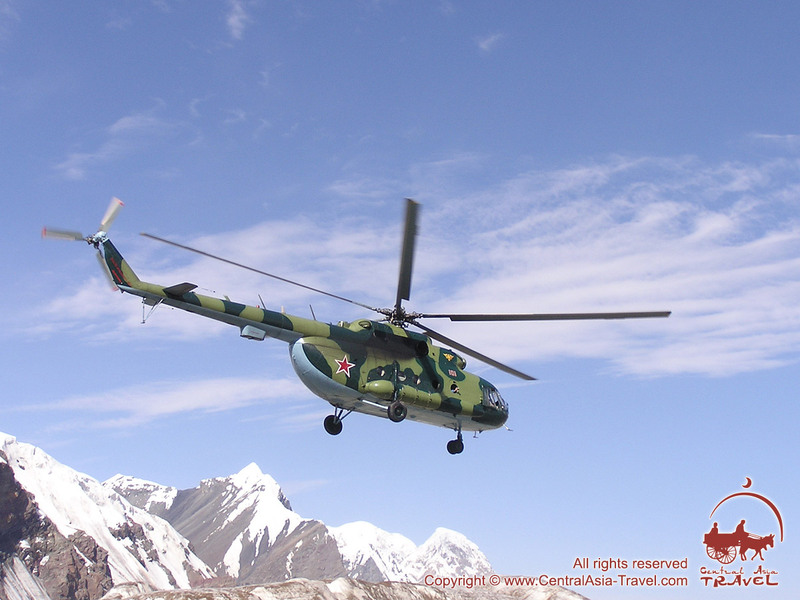 Day 3 Helicopter flight to the Base Camp “Khan Tengry” (4000m). 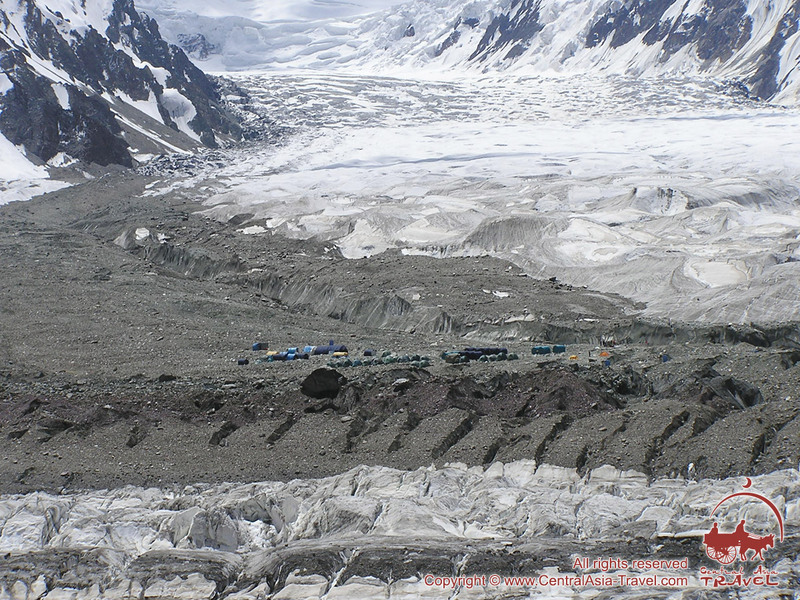 Base Camp “Southern Inylchek”, is located at the left-hand side moraine of the South Inilchek Glacier at the point of the glacier’s meeting with the Zvezdochka Glacier, which is on the height of about 4000m. Day 4 Familiarization with the territory the Khan Tengry Peak. Having waken up you will be impressed by a surrounding natural beauty. Acclimatization forays are waiting ahead. And you’ve got time to think and decide where you should store part of your belongings and how you’d like to spend free time in the Base Camp. You do not need to worry of your stuff if you choose using the storage room. The Base Camp’s manager (superintendent) is responsible for the whole stuff now and in case of a loss he pays with his own head! He, indeed, has got a trustworthy head, which you can rely upon. And take our good advice: do not waste your time sitting in the Base Camp all day long. It’s better spare your free time for acclimatization walks in the area. Just go and see it. Day 5 Acclimatization foray to Peak Khan-Tengry. Continuation of familiarization with the area. Preparation for climbing. 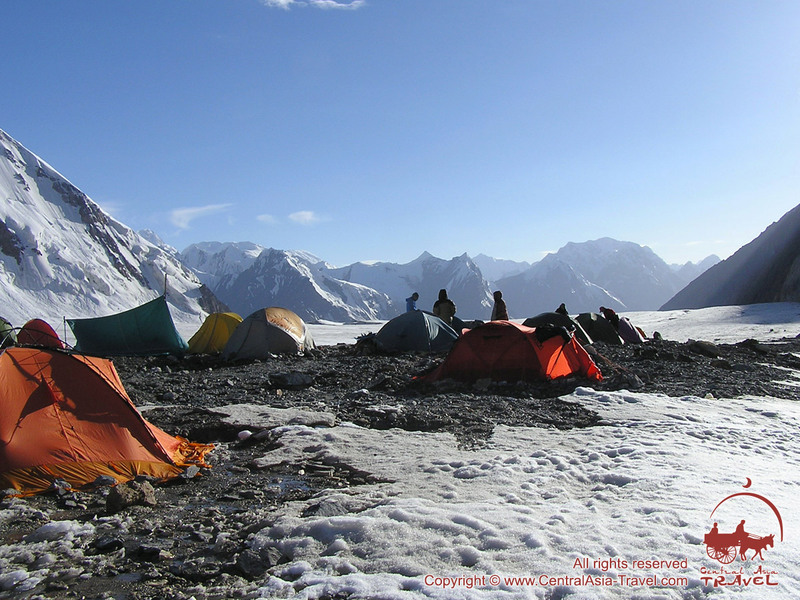 Day 6 Base Camp (4,000m) - Camp 1 (4,200m). 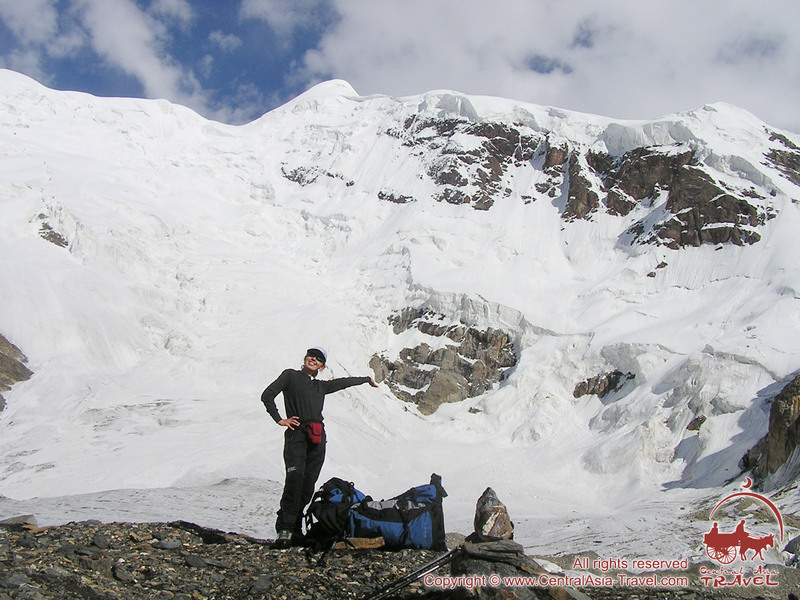 The itinerary begins from the Base Camp located at the left-hand side moraine of the South Inilchek Glacier at the point of the glacier’s meeting with the Zvezdochka Glacier, approximately at 4,000m above see level. Thence the route lies along the central part of the South Inilchek Glacier towards Camp 1 (4,200m). 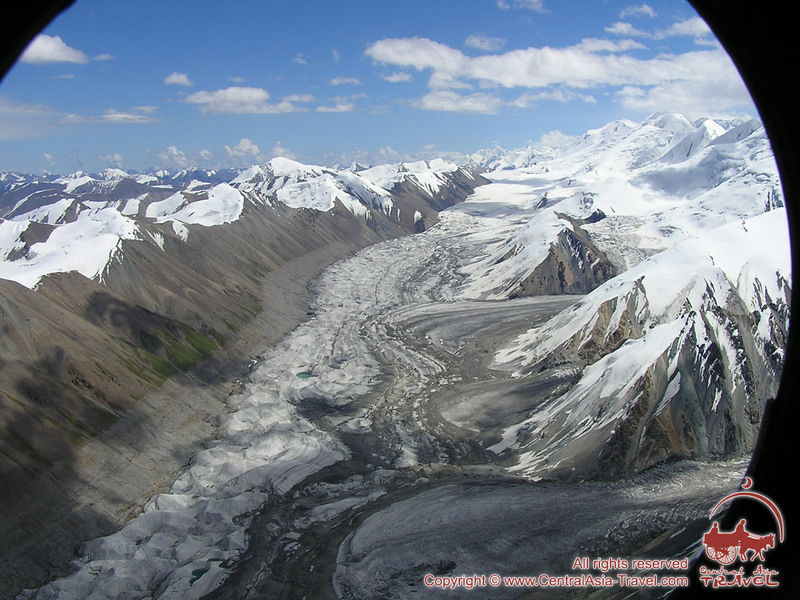 Camp 1 is usually set at junction between South Inilchek Glacier and Semenovskiy Glacier on the right-hand side moraine at the foot of the Peak Chapaev. Day 7 Camp 1 (4,200m) - Camp 2 (5,300m). You uphill along the Semenovskiy Glacier keeping at the ice-fall. 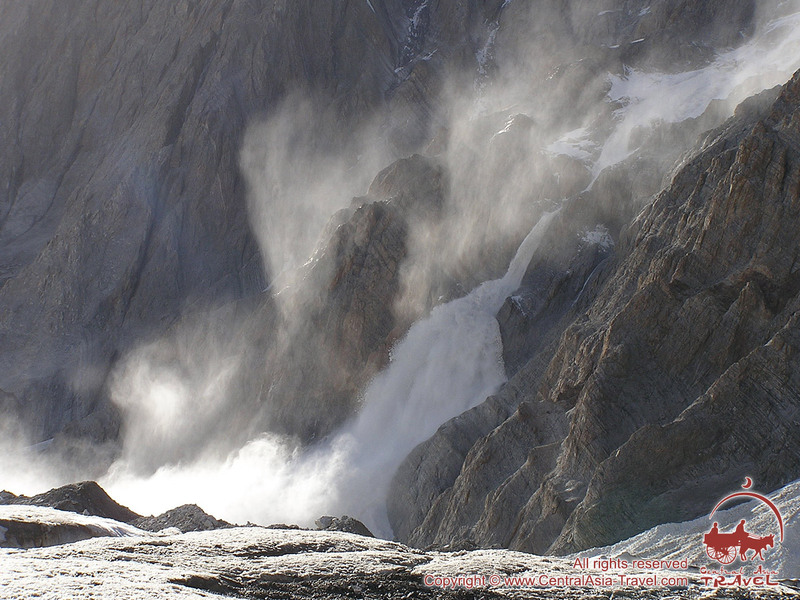 Upper reaches of the glacier are objectively dangerous due to possible icefalls rushing down from the Peak Chapaev and Peak Khan-Tengry. We highly recommend your very early start in the morning and going in non-stop regime for as long as possible. 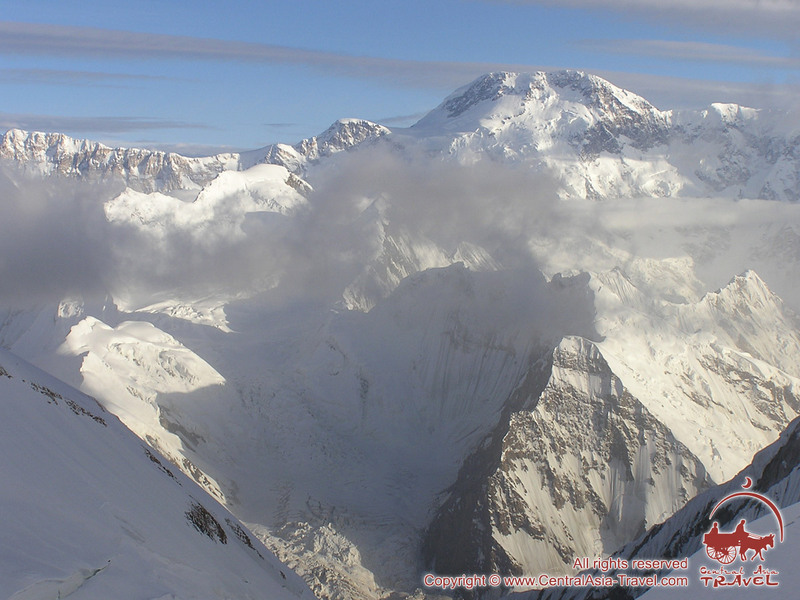 The icefall is passed either frontally through or bypassed on the slopes of the Peak Chapaev. Second option is faster but more risky than the first one due to high possibility of avalanches and rock-falls from the slopes of the Peak Chapaev. 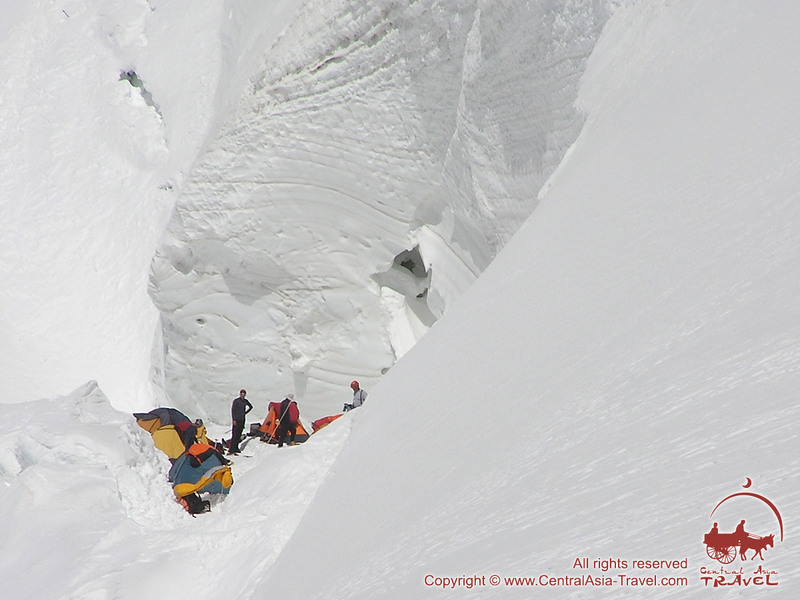 It is advisable that you move on the belay due to abundance of crevasses on the body of the glacier. 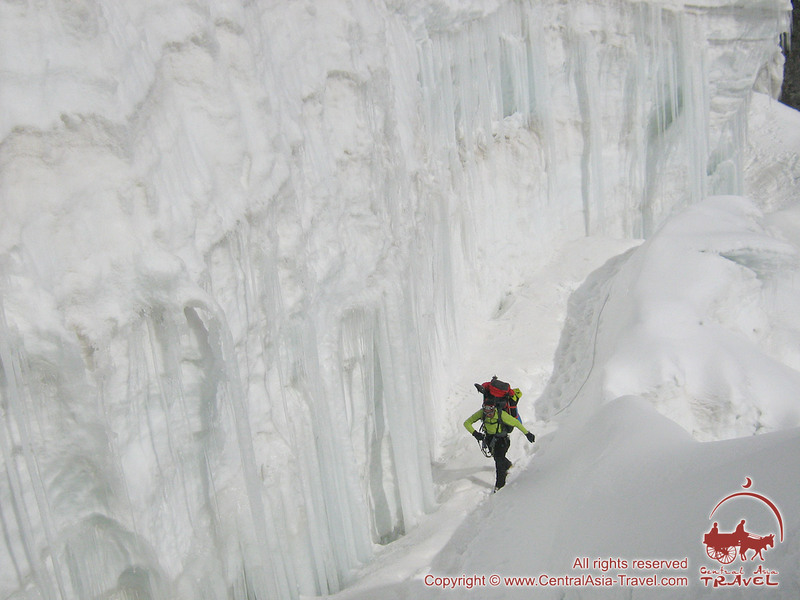 Having passed the icefall, you carry on to the upper cirque of the Semenovskiy Glacier housing Camp 2 (5,300m). 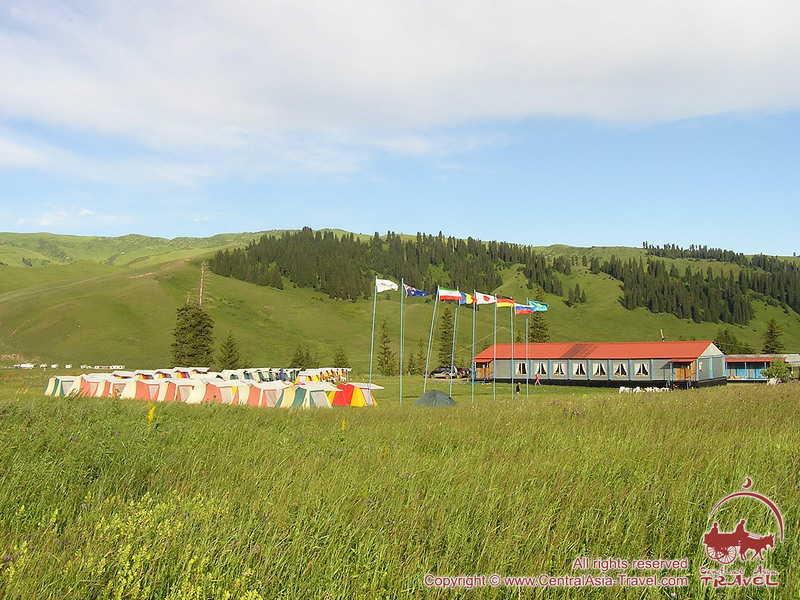 Traditionally, this camp is used during first acclimatization foray. But then at the second forays, they usually uphill from Camp 1 straight to Camp 3. Day 8 Camp 2 (5,300m) - Camp 3 (5,900m). From Camp 2 uphill on rather gentle slope to the upper reaches of the Semenovskiy Glacier keeping towards the saddle lying between Peak Khan-Tengry and the arm of the Peak Chapaev. You set your Camp 3 (5,900m) at the left-hand side part of the saddle. You may either put up tents or dig out burrows (caves) in the snow. Should you have luck, you may find and use burrows left by somebody else climbing before you. Day 9 Downhill to Base Camp (4,000m) along the path of uphill. Day 12 Camp 1 (4,200m) - Camp 2 (5,200m). Day 13 Camp 2 (5,200m) - Camp 3 (5,900m). Day 14 Camp 3 (5,900m) - Camp 4 (6,400m). From Camp 3 the route goes on through the saddle and along the western ridge of Peak Khan-Tengry. Passage on the ridge, as a rule, is secured by ropes fixed along the whole extent of the ridge. Beware of old worn-out fixed ropes often found on the way - these are ropes left by previous expeditions and they may be dangerous. Double your attentiveness! Up to 6,900m the route goes on the rocks, then on the snow cupola that turn into the narrow snow “knife” (crest) leading to the apex. Spots good for camping are available at heights 6,200m, 6,400m and 6,700m. 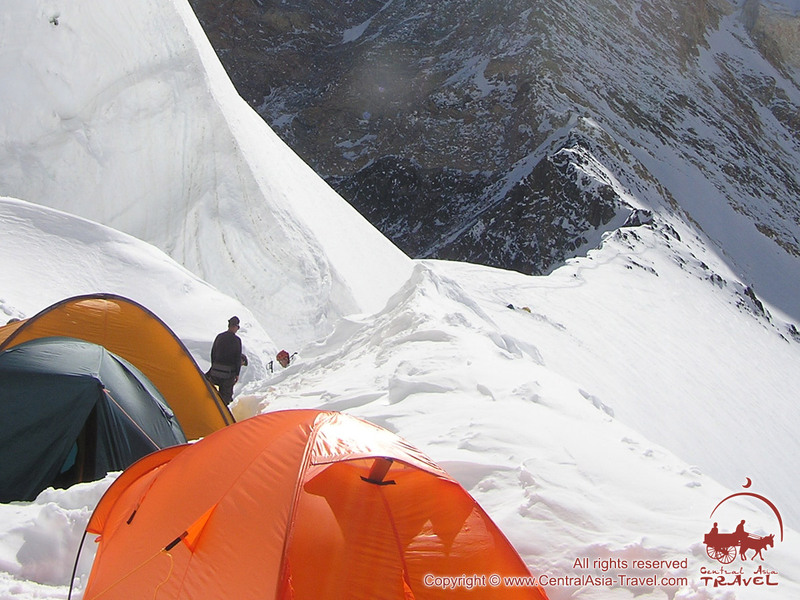 If needed, Camp 4 can set up there; most convenient spot is at 6,400m. Day 15 Uphill to the top of the Peak Khan-Tengry (6.995m). Downhill to Camp 3 (5,900m). Till altitude 6,700m you uphill on the right-hand side of the western ridge. 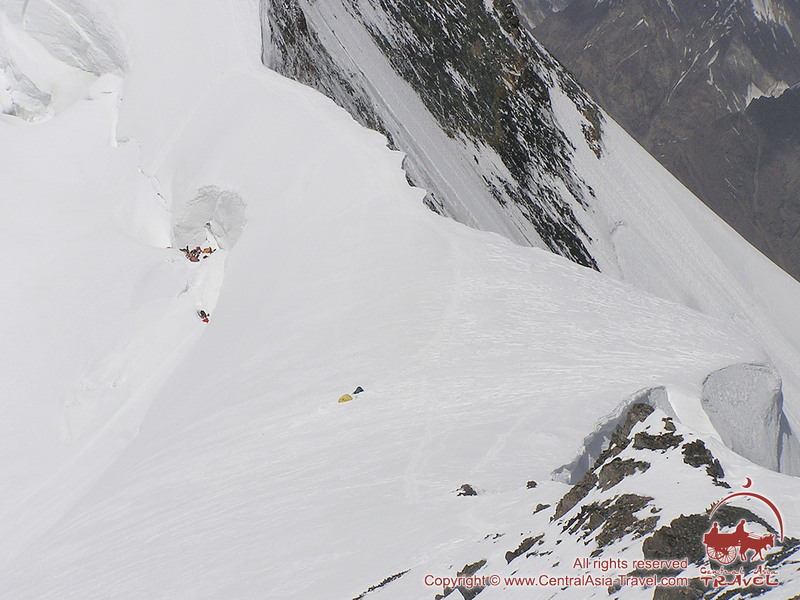 From altitude 6,700m carry on traversing to the right towards couloir. At the beginning of the couloir there is a 10m-high rocky wall. Thence along the couloir, and keeping on the right again. Climb up the rocks to get to the small snow crest turning into the small rocky wall 20m-high giving way to the apex. The summit is marked by rather unimpressive metal tripod. And… You are on the top, Hurray!!!! The entire Tian-Shan lies underneath your feet!!! In case of good weather, take 20 to 30 minutes break for photographing and enjoying the moment of victory, then - start downhill, as your way down is no less hard and risky than your way up is. Day 16 Downhill to Base Camp (4,000m) "Southern Inylchek". Day 17 Reserve days in case of bad weather. Well, weather in Tian-Shan is always kind of gambling. And you’ve got to always take into account the local “master’s” mood. Day 18 Reserve days in case of bad weather. Well, weather in Tian-Shan is always kind of gambling. And you’ve got to always take into account the local “master’s” mood. 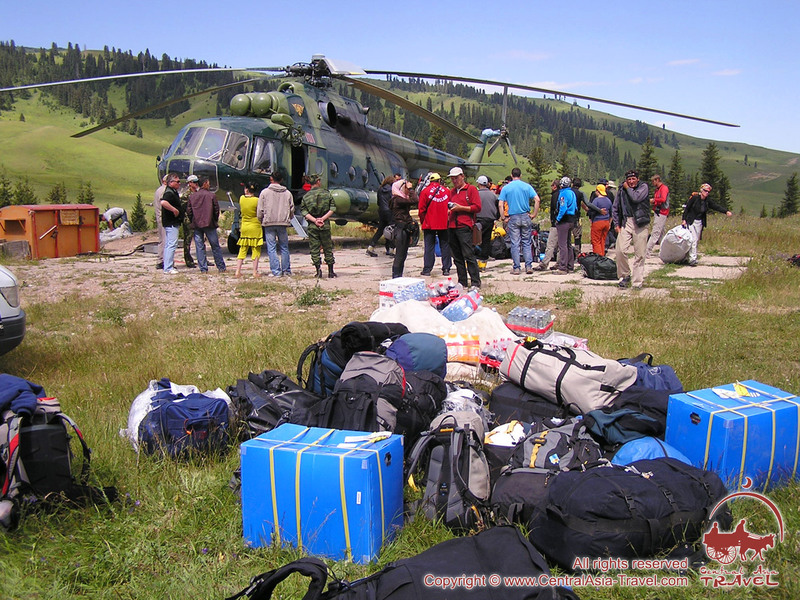 Day 19 Helicopter flight to Karkara and further on by road to Bishkek. Accommodation at a hotel, back to the amenities of long forgotten civilization, a night’s stroll in town, free time for shopping souvenirs. Day 20 Day at leisure. That is all. Tomorrow there is no contemplation on tactics of ascent, no planning for the current day, no hustle staffing of you backpack open to all shrilling Tian-Shan winds, no painful peering at the gorgeous and luring summit - that all is gone now. Tomorrow you are back to your everyday routine. But in the middle of humdrum life there will always be a moment of absolutely new feeling invariably bringing you back in your memories to what you once have endured, seen and felt last Summer way down at Peak Khan-Tengry. And a whisper creeping in to your ear from nowhere would suddenly say: “Hey, look, let us get back…”. Day 21 Departure from Bishkek. • Cost of the accommodation and 3 meals a day in Base camp Karkara - 45 USD / 1 night/ 1 person. 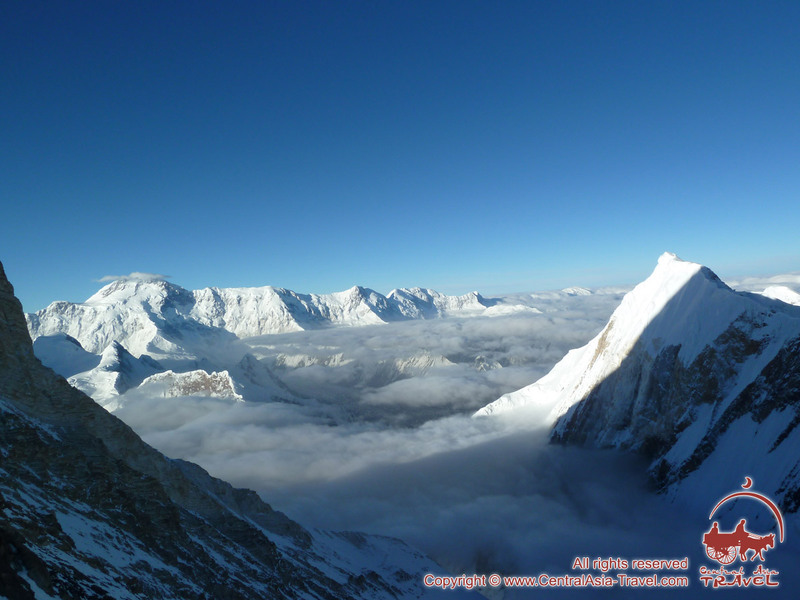 Special offer for Khan Tengri Peak expedition 2019! Climbing under the guidance of an experienced guide! Dear friends! Many of you ask us the same question: is it possible to join any combined group with a fixed date? 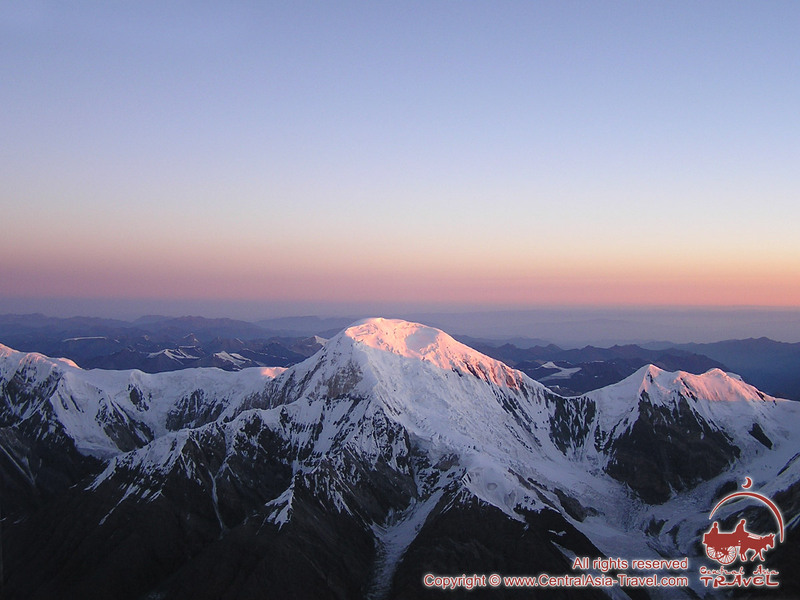 Because many of you don’t wish to climb the Lenin Peak alone! Somebody wants his happiness of viewing the world from such unbelievable height to be shared with the person holding the same views! So, we’ve got your point pretty well! That is why starting from 2016 season we have launched a new option for the combined groups with the fixed dates. - group of 7-10 pax - 1 guide and 2 guide’s assistants. • Official registration with authorities of Kyrgyzstan and visa support letter (if needed). Important!!! Everyone who applies to join any combined group must plan his/her arrival date so as he/she has already arrived to the Bishkek till the starting date of the active part (see table above, column “Starting date of the active part”). You can also enjoy additional services, but for an additional fee according to price list. In order to receive admission in the area of border control and registration with the Ministry of Internal Affairs you should send the following passport information: a copy of the passport or: full name, date of birth, nationality, passport number, as well as the planned dates of your stay. Registration must be done no later than one month before your arrival! We are waiting for your applications, friends! And we’ll gladly answer all your questions! Day 3 Helicopter flight to the Base Camp "Nothern Inylchek". Day 4 Acclimatization and preparation for climbing. Day 5 Ascent to Camp 1. Day 6 Ascent to Camp 2. Day 7 Radial ascent to the Chapaev peak. Day 8 Descent to Base Camp. Day 10 Day of preparation for the ascent. Day 11 Ascent to Camp 1. Day 12 Ascent to Camp 2. Day 13 Ascent to Camp 3. Day 14 Ascent to the summit 6995 m and descent to Camp 3. Day 15 Descent to Base Camp "Nothern Inylchek". Day 16 Reserve days in case of bad weather. Day 17 Reserve days in case of bad weather. Day 18 Reserve days in case of bad weather. 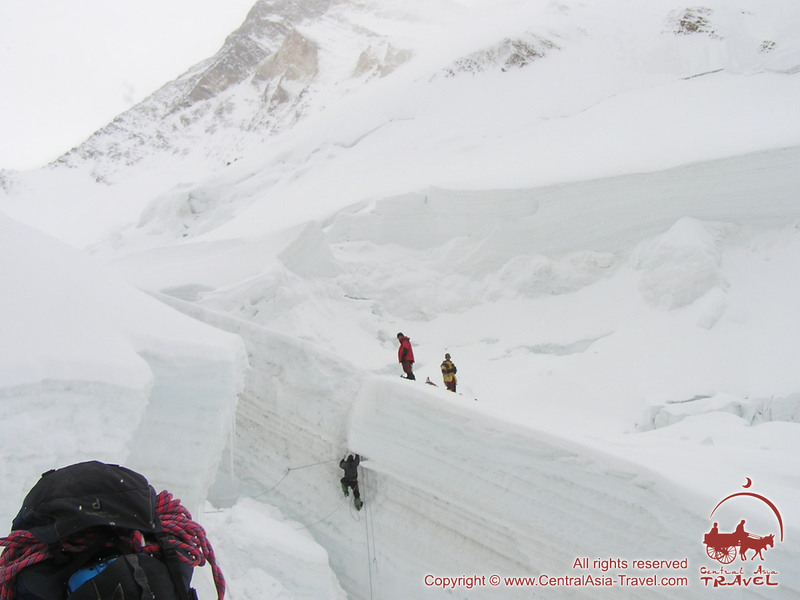 Day 15 Descent to Base Camp "Southern Inylchek". How do I book services of high-altitude guide? Should mountaineers have the insurance? 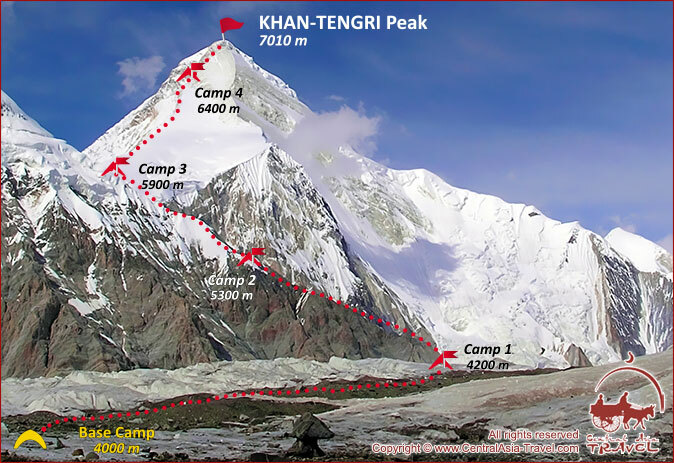 What are minimal technical qualification requirements for climbing Khan-Tengry Peak? What kind of climbing equipment do I need? What currency is in circulation in the Base Camp? Are there fixed ropes along the route of ascent? Which documents should I have and what is the procedure of registration in OVIR (local registration department)? Where can I buy the permit for ascent? 1. 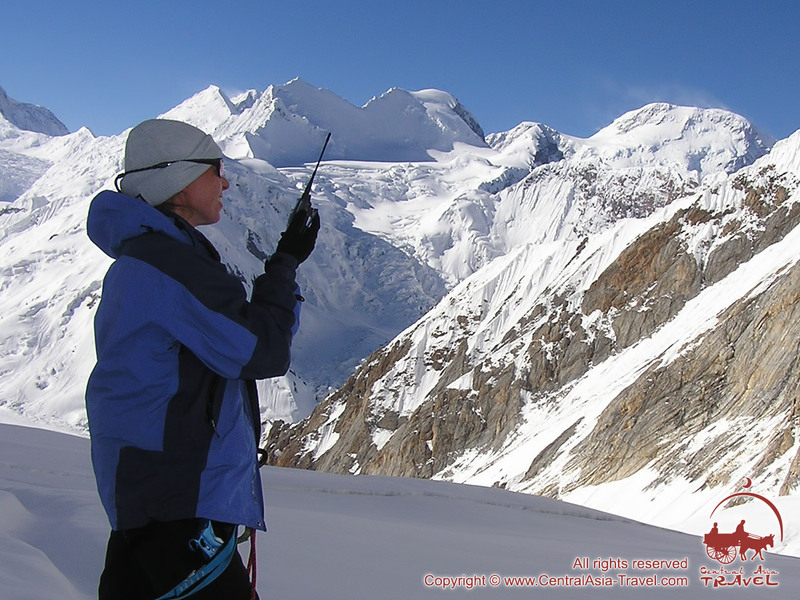 How do I book services of high-altitude guide? You may order for the services of high-altitude guide beforehand through e-mail while in the correspondence with our agency. 2. Should mountaineers have the insurance? 3. What are minimal technical qualification requirements for climbing Khan-Tengry Peak? 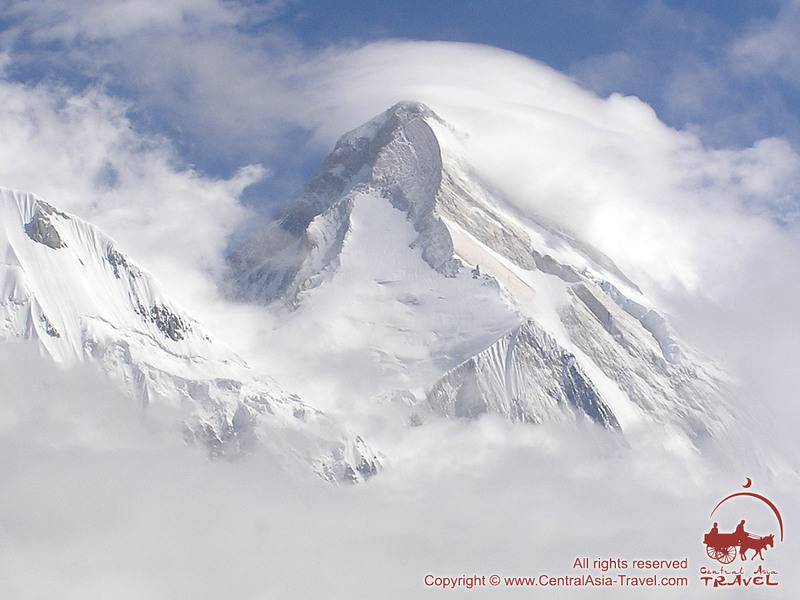 Khan-Tengry Peak is a difficult summit to climb, as technically so as physically. You shouldn’t try to make an ascent having experience of some easy routes and without certain climbing experience.Traditionally before the meeting with this Mountain, it’s better to make ascents to the peaks: Lenin Peak, Muztag-Ata Peak. They are not so difficult technically, but allow understanding how altitude influences your organism.Essential is your sound physical sporting conditions and good acclimatization (especially if you don’t have any previous high-altitude ascent experience). 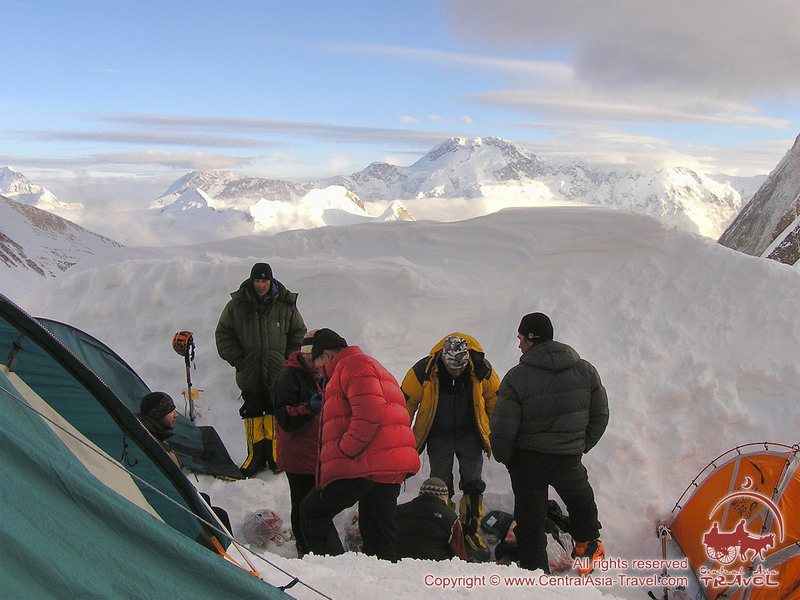 You can begin to train and acclimatize even before the arrival to the Base Camp, as it’s located at the height of 4000m. If you have no such opportunity, it’s necessary to do it on the glacier of Southern Inylchek. There are a lot of possibilities for such acclimatization routes. (Look information about routes here and at our web-site)There is one more important factor - person who’s going with you. 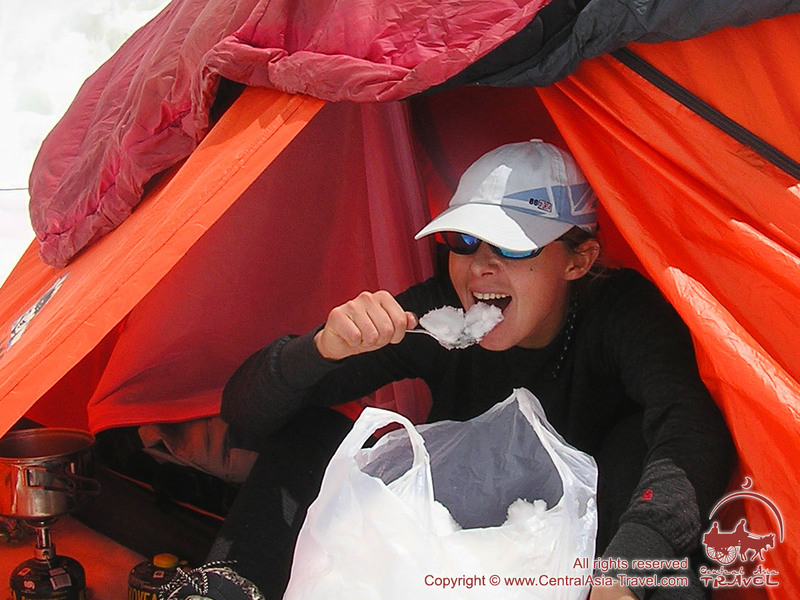 Though everybody’s “dying” alone there should be the person who can share the difficulty of the expedition with you - share tent, meal, rope, gas. To have such experienced man in the team is very important: he won’t panic in any extreme situation and help you with advice or action at right moment. We suggest that you book services of our mountain guide. Do not forget to see our doctor before starting the climb! 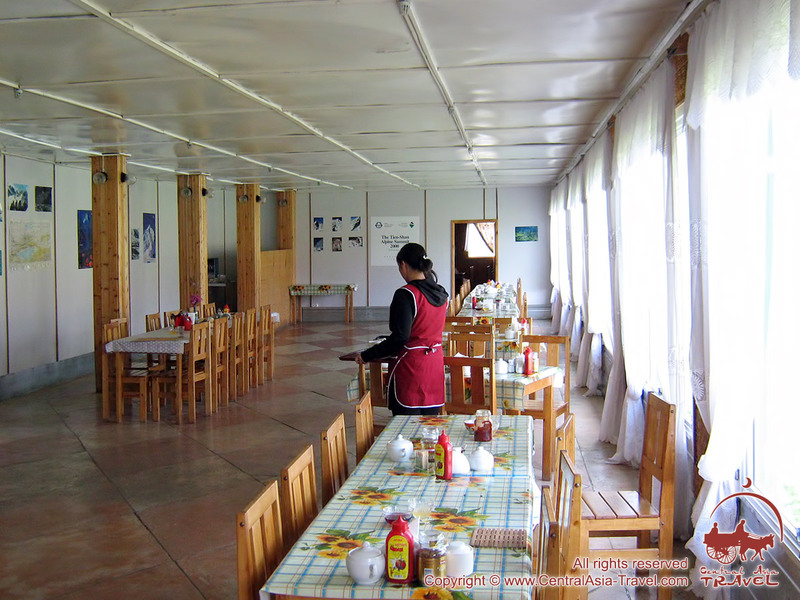 You will be provided with 3-time-a-day full meals at the Base Camp. But at Camp 1, Camp 2, Camp 3 and Camp 4 you will have to organise your own meals. So, highly suggested that you bring your high-altitude foodstuff with you (from country of your original departure), as you won’t be able to find it in Bishkek. 5. What kind of climbing equipment do I need? Extreme and unpredictable weather, altitude and expedition itself demands reliable equipment. 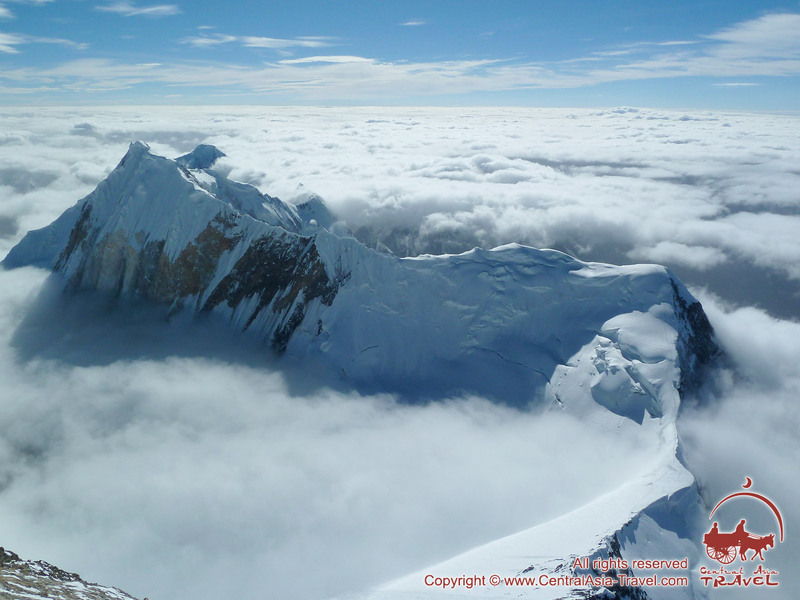 In order to succeed in ascending to Khan-Tengry Peak we would suggest that your high-quality reliable climbing equipment would include as follows: a pair of high-altitude mountain plastic double boots, a pair of tracking boots/shoes. Shoes should be free and comfortable upon walking. Warm breeches for the height higher than 4500m, warm mittens, gloves, a warm hat, a cap, a rainproof costume, woollen socks (2-3 pairs), warm sweater or jacket, a high-altitude tent, a rug/sleeping pad, a down sleeping-bag (capable of withstanding a frost down to -10C - - 20C), a rucksack (60-100 litre big), , high-altitude sun glasses (make sure you have a spare one! ), a tube of UV skin protection cream (factor 25 and higher), a lipstick, a face-protecting mask, a personal high-altitude first-aid kit, a pair of telescopic ski poles, an ice-axe, crampons, a helmet, a basic rope (8-11 mm diameter, 20-30m long), safety system (a “cradle”), “jumar”, carabineers (3-5 pieces), ice- screws (2 pieces), a safety halyard (diameter 4-5 mm, 2-3 m long), a head- or flash-light, a down jacket and pants. 6. What currency is in circulation in the Base Camp? In Bishkek (starting point) you can change your hard currency into local currency - Som. At the Base Camp traditionally US dollars, Euro, Kyrgyz Som are used. 7. How do I pay for my tour? - Member’s request for participation in Khan-Tengry / (Pobeda) peak expedition is registered after making 30% pre-payment from the cost of chosen package, it should be done not later then 1 month before the date of season starts (July 15th). Member should send to us scanned copy of payment order by e-mail. - Not later then 2 weeks before the date of arrival member should confirm (or cancel) his participation in the program, and he should make payment of the rest sum from chosen package, having sent to us scanned copy of payment order by e-mail. 8. Are there fixed ropes along the route of ascent? Yes, there are fixed ropes along the route. The route of ascent along Western ridge has fixed ropes at all dangerous and difficult parts. Our high-altitude guides do it at the beginning of the season. Fixed ropes will make you ascent easier up to the summit and they will be very useful for fast descent to the Base Camp. Be careful while choosing the rope: there are often old and shabby ropes along the route! 9. Which documents should I have and what is the procedure of registration in OVIR (local registration department)? It’s necessary to have passport upon arrival to the country. 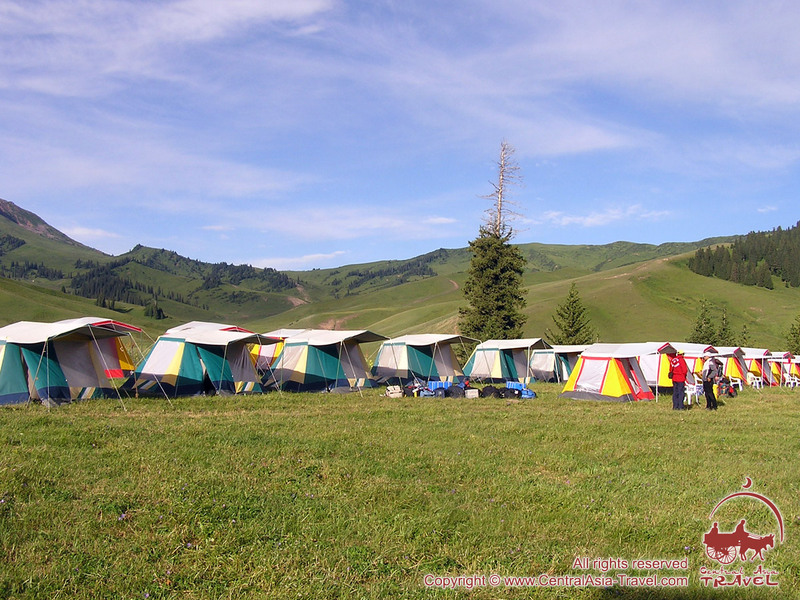 For free staying on the territory of Kyrgyzstan and in the Base Camp you must get registration in OVIR (local registration department) during 5 days. Also it’s necessary to have a border permit, because state border with China goes quite close. 10. Where can I buy the permit for ascent? You don’t need the permit for ascent. For issuing a frontier zone permit and for registration in the Ministry of Home Affairs’ authorities it is necessary (not later than 1 month before your arrival) to send us the following passport data: passport copy, or: your full name, date of birth, nationality, passport number, and planned period of your staying in Kyrgyzstan. 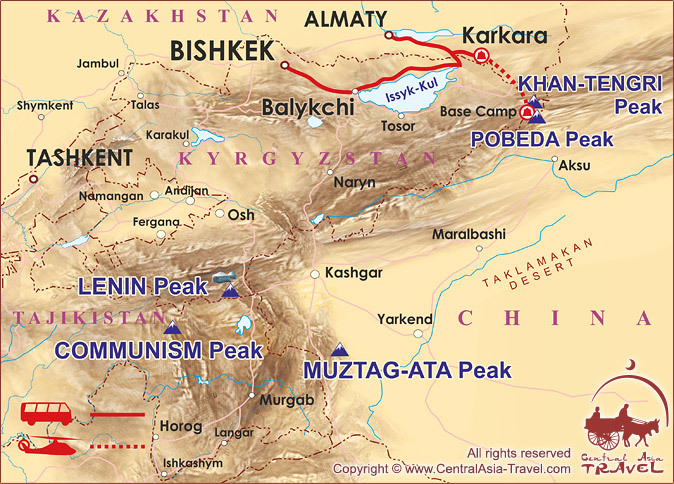 ** Note: If you plan to ascend Pobeda Peak after you have ascended Khan-Tengry, you do not have to pay for doing so additionally. Base Camp (4000 m) to Camp 1 (4200 m). The route begins from the BC located at the left-hand side moraine of the South Inilchek Glacier at the point of the glacier’s meeting with the Zvezdochka glacier, approximately at 4,000m above see level. Thence the route lies along the central part of the South Inilchek Glacier towards Camp 1 (4,200m). Camp 1 is usually set at junction between South Inilchek Glacier and Semenovskiy Glacier on the right-hand side moraine at the foot of the Peak Chapaev. Camp 1 (4200 m) to Camp 2 (5300 m). You uphill along the Semenovskiy Glacier keeping at the ice-fall. Upper reaches of the glacier are objectively dangerous due to possible icefalls rushing down from the Peak Chapaev and Peak Khan-Tengry. We highly recommend your very early start in the morning and going in non-stop regime for as long as possible. 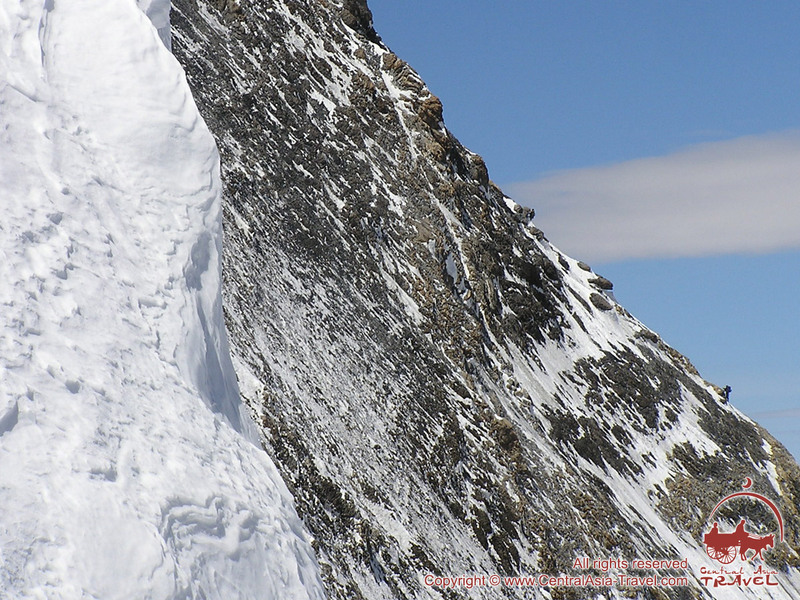 The icefall is passed either frontally through or bypassed on the slopes of the Peak Chapaev. Second option is faster but more risky than the first one due to high possibility of avalanches and rock-falls from the slopes of the Peak Chapaev. 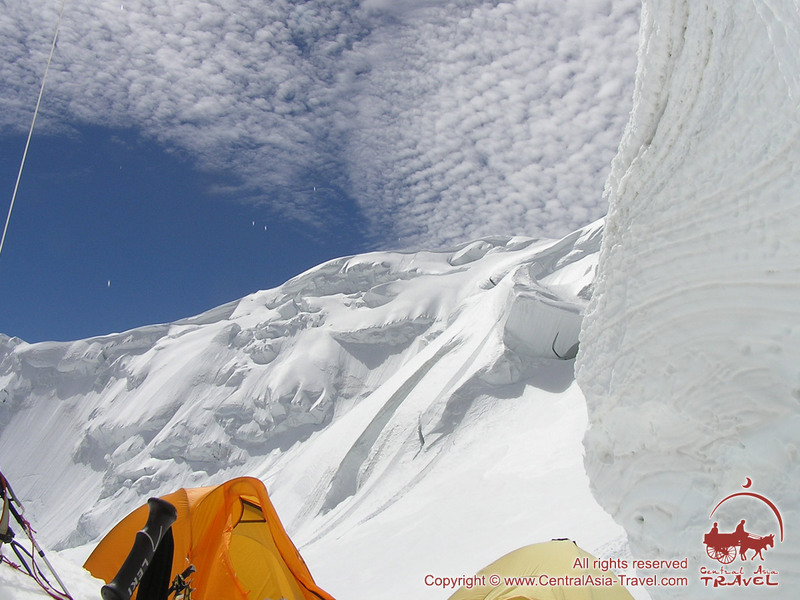 It is advisable that you move on the belay due to abundance of crevasses on the body of the glacier. Having passed the icefall, you carry on to the upper cirque of the Semenovskiy Glacier housing Camp 2 (5,300m). 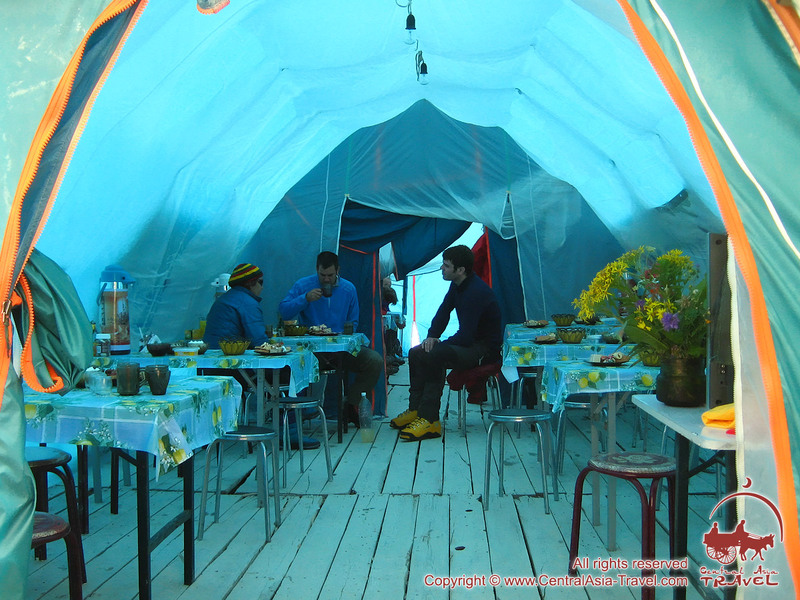 Traditionally, this camp is used during first acclimatization foray. But then at the second foray they usually uphill from Camp 1 straight to Camp 3. Camp 2 (5300 m) to Camp 3 (5900 m). 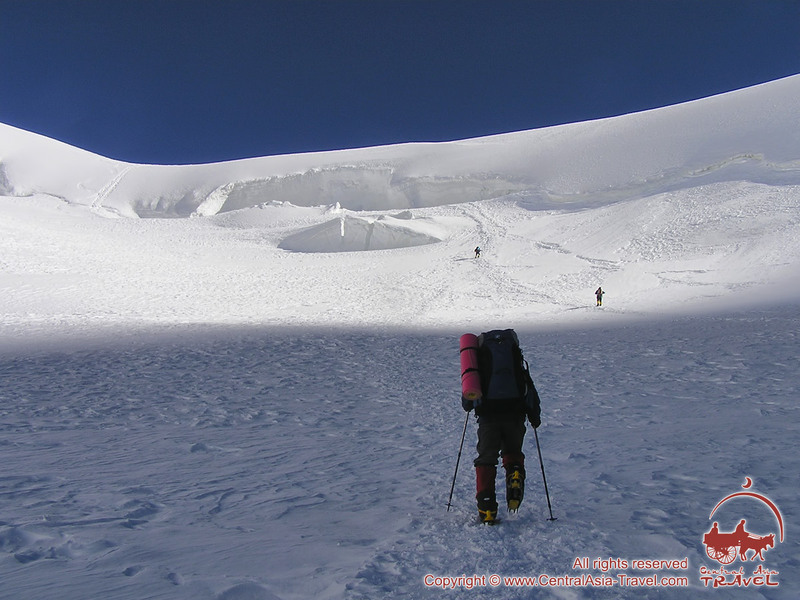 From Camp 2 uphill on rather gentle slope to the upper reaches of the Semenovskiy Glacier keeping towards the saddle lying between Peak Khan-Tengry and the arm of the Peak Chapaev. You set your Camp 3 (5,900m) at the left-hand-side part of the saddle. You may either put up tents or dig out burrows (caves) in the snow. Should you have luck, you may find and use burrows left by somebody else climbing before you. Camp 3 (5,900m) to Camp 4 (6400 m). From Camp 3 the route goes on through the saddle and along the western ridge of Peak Khan-Tengry. Passage on the ridge, as a rule, is secured by ropes fixed along the whole extent of the ridge. 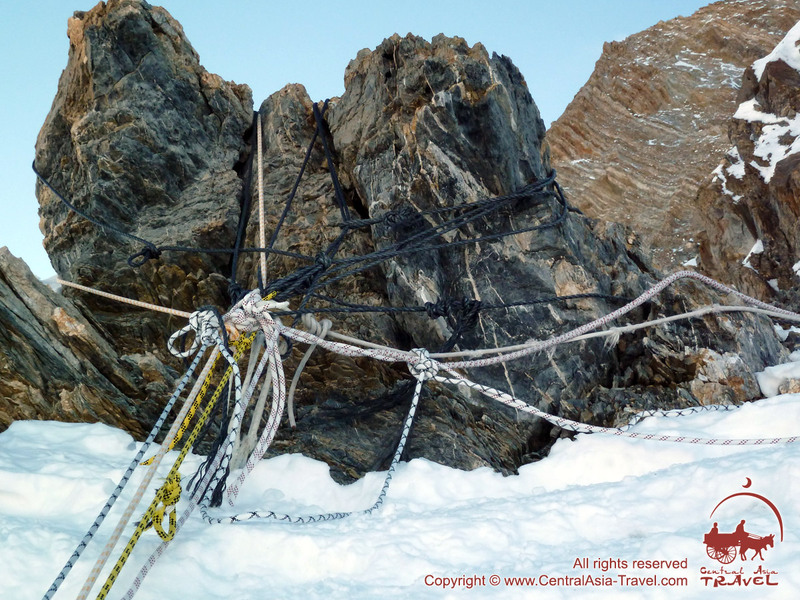 Beware of old worn-out fixed ropes often found on the way – these are ropes left by previous expeditions and they may be dangerous. 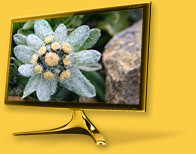 Double your attentiveness! Up to 6,900m the route goes on the rocks, then on the snow cupola that turn into the narrow snow “knife” (crest) leading to the apex. Spots good for camping are available at heights 6200 m, 6400 m and 6700 m. If needed, Camp 4 can set up there; most convenient spot is at 6400 m.
Uphill to the top of the Peak Khan-Tengry (6995 m). Downhill to Camp 3 (5900 m). Till altitude 6,700m you uphill on the right-hand side of the western ridge. From altitude 6,700m carry on traversing to the right towards couloir. Take up the rocky wall 10m-high at the mouth of the couloir. Thence along the couloir, then keeping on the right again. Climb up the rocks to get to the small snow crest turning into the small rocky wall 20m-high giving way to the apex. The summit is marked by rather unimpressive metal tripod. You are on the top, Hurray! 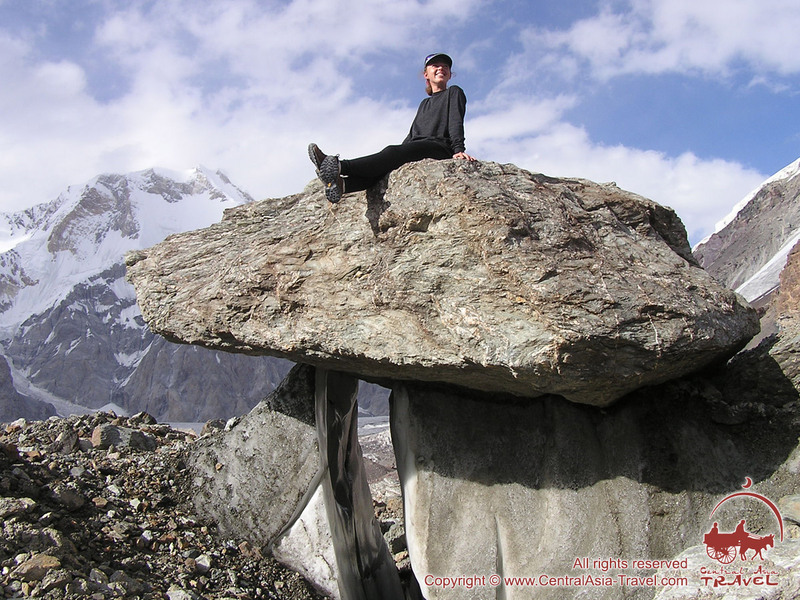 The entire Tian- Shan lies underneath your feet! In case of good weather, take 20 to 30 minutes’ break for photographing and enjoying the moment of victory, then – begin downhill, as your way down is no less hard and risky than your way up is.